Case Type Snapper DVD Extras: Interactive 3D Menus, Trailer, Commentary, Isolated Musical Score, La Magra, Designing Blade, The origins of Blade, The Blood Tide, Storyboards, Web Access, Pencil to post, Cast and crew biographies etc..
IMDB Rating 7.1 DVD-ROM PC Friendly and more. Modern discoglad vampires meets modern superhero! Blade is a terrific different action movie. The film is entertaining and the action is overwhelming. 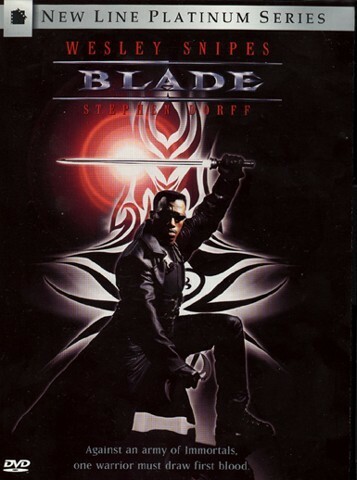 Blade is the name of the main caracter who`s half human and half vampire. Blade`s mother were bitten by a vampire while she was pregnant with him. She died giving him birth, and this changed Blade`s DNA. He svore revenge on all bloodsuckers, and you will see that he means it. 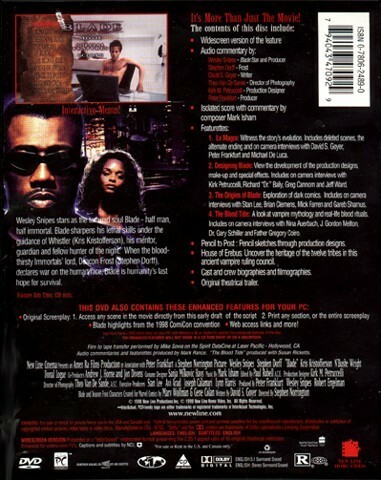 Blade is portrayed by Wesley Snipes, and in the role of his enemy Deacon Frost, we`ll meet Stephen Dorf. I`ve seen this movie 4 or 5 times, and will recommand it if you like action mixed with fantasy. On a scale from 1-6, i will give Blade 4. That means that this is a very good movie.